Text: Experience has taught us to disregard placards. So we enter the hall in innocence and give ourselves to the preliminary entertainments. They are always very various, and whether good or bad we charm them, powerfully or feebly according to our condition, with the charm of our confident anticipation. A good mood will fling some sort of life even into the most tasteless of the local advertisements that immediately precede the real business of the evening, beginning when at last we are confronted with a title, set, like a greeting in a valentine, within an expressive device. We peer for clues. Sometimes there is no clue but the title, appearing alone in tall letters that fill the screen, fill the hall with a stentorian voice. Thrilling us. We know we are being got, but not yet at what vulnerable point and we sit in suspense while the names of author, adapter, producer, art-director, photographer and designer come on in curly lettering and singly, each lingering. Then there is a screenful of names, the parts and their players, also lingering and perhaps to be followed by further information. We do not desire it but may not now turn away from the screen. At any moment the censor’s permit will appear and whether lingering or not — usually by this time the operator has gone to sleep in his stride and it lingers — this last barrier must be faced for the length of its stay or we may miss the first caption. At one time we used to pay devout attention to the whole of these disclosures. They were a revelation of the size of the undertaking and our wondering gratitude went forth to the multitude of experts who had laboured together for our enterprise. But after a while the personal introduction of all these labourers became a torment. We grudged the suspense exacted by what might prove to be a record of wasted effort. In due course and as if in awareness of our overtaxed patience the preliminaries were reduced to title, name of author, of a star or so, official permission, each hurrying by, hurrying us towards the caption that should launch us on our journey: a screenful of psychology, history, or description of period and locality. There is eager silence in the hall during the stay of the oblong of clear print whether beginning: “Throughout the ages mankind has — ” or “Avarice is the cruellest” — or “In a remote village of the Pyrenees, far from — “. When we have read we know where we are supposed to be going; we have grown accustomed to finding our places in the long procession of humanity, to going down into the dread depths of our single selves, to facing life in unfamiliar conditions. But we do not yet know whether our journey is to be good. Whether there is to be any journey at all. So we are wary. We remember films whose caption, appearing in instalments at regular intervals, has been the better part, presenting, bright and new, truths that in our keeping had grown a little dim, or telling us strange news of which within reason we can never have too much. We have come forth, time and place forgotten, surroundings vanished, and have been driven back. Very often by people whose one means of expressing emotion is a vexed frown, or people whose pulpy rouged mouths are forever at work pouting, folding, parting in a smile that laboriously reveals both rows of teeth. These people, interminably interfering with the scenery, drive us to despair. Sometimes we are too much upset to battle our way to indifference and see, missing what is supposed to be seen, anything and everything according to our mood; it is difficult to beat us altogether. We remember films damaged by their captions. Not fatally. For we can substitute our own, just as within limits we can remake a bad film as we go. With half a chance we are making all the time. Just a hint of any kind of beauty and if we are on the track, not waiting for everything to be done for us, not driven back by rouged pulp and fixed frown, we can manage very well. For the present we take captions for granted. But we are ready to try doing without them. Now and again a film gathers us in without any clear hint beyond the title. This we love. We love the challenge. We are prepared to go without a hint even in the title. We are prepared for anything. We trust the pictures. Somewhere sooner or later there will be a hint. Or something of which we can make one, each for himself. The absence of any hint is a hint we are ready to take. Perhaps the truth about captions is just here: that somewhere, if not in any given place then all over the picture, is a hint. The artist can no more eliminate the caption than he can eliminate himself. Art and literature, Siamese twins making their first curtsey to the public in a script that was a series of pictures, have never yet been separated. In its uttermost abstraction art is still a word about life and literature never ceases to be pictorial. A work of pure fantasy bears its caption within. A narrative, whether novel, play or film, supplies the necessary facts directly, in the novel either by means of the author’s descriptive labels or through information given in the dialogue, in the play by means of that uncomfortable convention that allows characters to converse in anachronisms, in the film by means of the supply of interlarded words. And if the direct giving of information in captions is the mark of a weak film, the direct giving of information in a play or novel is the mark of a weak novel or play. There are masterpieces enough to flout the dogma. 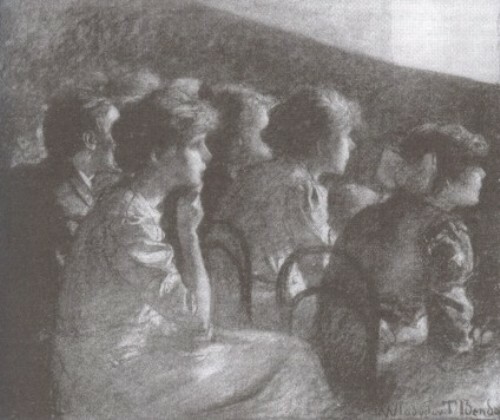 Nevertheless the film has an unrivalled opportunity of presenting the life of the spirit directly, and needs only the minimum of informative accompaniment. The test of the film on whatever level is that the wayfaring man, though a fool, shall not err therein, though each will take a different journey. The test of the caption is its relative invisibility. In the right place it is not seen as a caption; unless it lingers too long upon the screen. Comments: Dorothy Richardson (1873-1957) was a British modernist novelist. Through 1927-1933 she wrote a column, ‘Continuous Performance’ for the film art journal Close Up. The column concentrates on film audiences rather than the films themselves. This entry was posted in 1920s, Film journals, United Kingdom and tagged Credits, Dorothy Richardson, Intertitles. Bookmark the permalink.